I own a timecaster that my father gave to me. Unfortunately, it's been stripped of paint. I'm trying to restore it now though. I'm wondering if anyone has a way of getting the Time logo decal for the headstock. Any help is appreciated. Thanks! Time Guitars used what is called 'Decalomania'. This is a paper backed release decal that was silk screened with lacquer 'ink' along with a lacquer overlay clear coat. After it was applied the subsequent finish coats would 'melt' this lacquer ink. This is very different than what you see on a Fender, Gibson, or what ever guitar. On those guitars you can see the decal outline in the finish. This method was popular with builders during the 1920/30s. We only used Black or Gold decalomania logos. Our logos were made for us by Joan, who ran a sign/silk-screen shop in Burlington. I'm sorry but I don't remember her last name. The reason I'm telling all this is because all these were lost in the fire. You may have luck Googling for Decalomania. I found quite a few sites that explain the process. The alternative is to use a ink jet with special decal paper. You can find that by Googling also. This is not as cool as decalomania but it should work. The logo was the same one we used on our letterhead. You could also PM SollyDad. He might have some. Check his post here. Thanks and keep us posted during your restoration. P.S. I may move this post to the 'How They Were Made' section. Hey, thanks. I've been listening to my Dad's old music, and the guitar sounds amazing. It's solid maple, really beautiful. 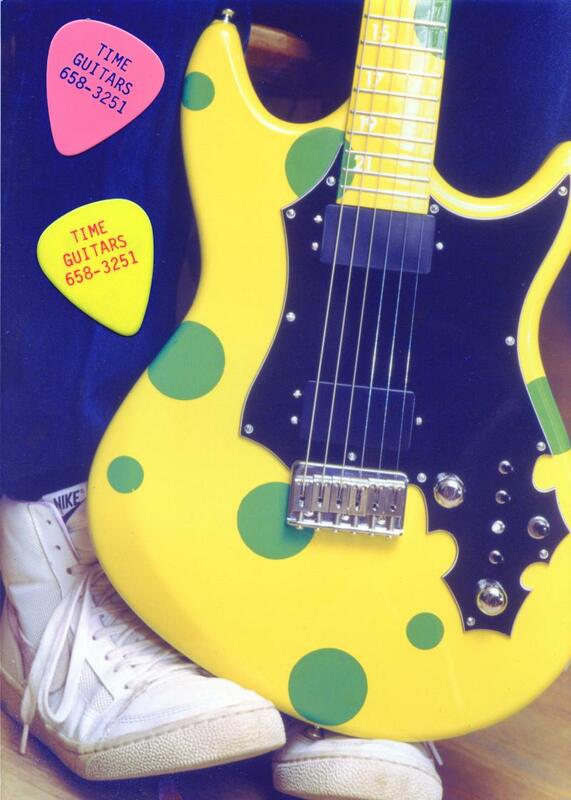 Of course, when he had it made, it was bright yellow with a mirror pickguard. He stripped the paint though, and the electronics were fried, so it's not going to be to original specs by any stretch of the imagination. That's unfortunate about the fire. Thanks for the speedy reply though. I'll keep you posted with the status of this one. Today I hit the jackpot by googling for 'waterslide decals'. You will find links for the ink-jet & laser papers and also many you-tube videos on how to do this. I remember your guitar now. The mirror pickguard is an original Time. [don't lose it!] Your guitar was the same yellow as the Polka-dot caster and the GS 'Scuba' guitars. No one has posted about the Scuba guitar. Not sure where that one went. These were all built in the same run/batch. We had some Corvette Yellow and thought, what can we do with this?